Venturi meter and orifice plate effects are two main and very important phenomenas in fuild mechanics sub field of mechanical engineering. In this post the effect of venturi meter and orifice plate on the fluid flow will be disciussed and complete work will be presented in the form of report. According to Michael Reader-Harris (n.d) Venture meter is an instrument use to study the flow of fluid when it passes through the converging section. There is an increase in the velocity and decrease in the pressure of the flowing fluid when the area available to flowing fluid decrease, this effect is called the venture effect named after the physicist who first introduces this theory. According to Michael Reader-Harris (n.d) Orifice plate is an instrument use for three different applications one to measure the flow rate, second to restricting the flow and third is to reduce the pressure of the flowing fluid. It depends on the orifice plate associated calculation method that either mass flow rate or the volumetric flow rate is used for calculation. It uses the Bernoulli’s principle which shows the relationship between velocity and pressure of flowing fluid. When one increase then the second one decrease. According to Miller, R.W (1996) principle of continuity state that the decrease in the area of the flowing fluid will increase the velocity of the flowing fluid. With this increase in velocity of fluid, the fluid pressure will decrease to conserve the mechanical energy according to the law of conservation of energy. Flow rate is the product of the velocity of the flowing fluid with area from which fluid is flowing. In venture meter the area of the tube decrease gradually due to which the velocity increase to keep the flow rate constant. In the orifice plate there is sudden decrease in the area of the flow due to restriction of the orifice plate. Due to this velocity will increase and pressure will decrease. To setup the orifice tube and venture meter apparatus two tubes were connected one on each of the outlet and inlet of the apparatus. Tube which was connected to the venture meter outlet was further connected to the measuring tank. To level the orifice meter and venture tube apparatus, adjustable screws are provided at the apparatus. Apparatus was connected to the power source to run the motor for water supply. Bench valve and the control valve of the apparatus were open to let the water move into the tube and to remove all the air pockets. · 2. Result shows that with decrease in the flow rate the value of the ∆h is also decreasing. So it can be said from the results that the difference in the height of water level is directly proportional the flow rate. · 3. 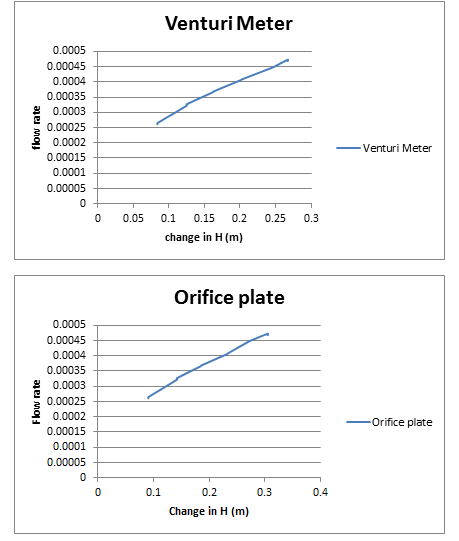 Change in the height of the water column of the venture meter is much less than the change in the height of water column in the orifice plate this is because the difference in diameter of the areas of orifice is much more than the venture meter. So we can say that the difference in height of water column is directly proportional to the difference in the diameter of the area.